I simply fell in love with all the colourful jeans this year. 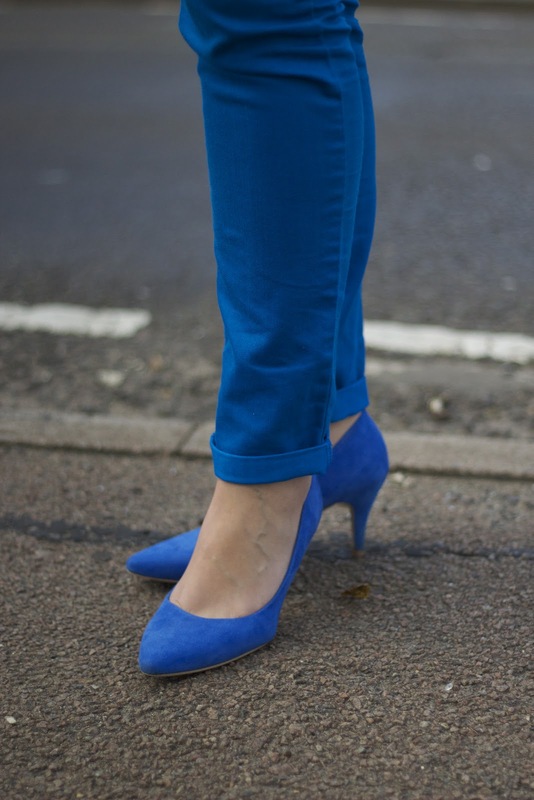 Dear high street designers - thank you very much for providing us with hot pink, mint green, bright orange and cobalt blue sets of skinny jeans! They always make me feel good when I wear them to work with a white crisp shirt or a backless lace top on a night out. I'm hoping to continue our relationship despite the fact that ox blood or burgundy are creeping in for the winter. Since the weather in the UK is not the best during the coldest season, I'll try to brighten up my look with colour blocking. Why not?! Autumn does not necessarily mean that the only way is grey, does it? I paired my favourite light cobalt blue jeans with a wonderful silky embellished shirt I got this year from Zara. One of my favourite items to wear for work and lunch dates. I hope you like the combination of those two colours as much as I do!